How should I select my class? We recommend that you choose your class based on what interests you. We encourage you to rank at least two courses, but be sure that any course you rank on your application is something you’d be willing to take and pay for. Apply early to have the best chance for placement in your first choice! Will I receive a grade or credit for my class? No, WAVU does not give grades or award credit. We want you to stretch your intellectual capacity without fear of failure. Because WAVU goes by so fast, instructors do not have enough time to get to know students well enough to be able to fill out an informative rubric. Your parent will have the opportunity to speak to your instructor at the Open House Saturday evening. Will I spend the night? 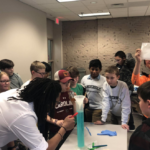 Previously WAVU has incorporated an overnight component, but due to family and student feedback, we have opted for a longer Saturday all-day program that immerses students in a laboratory environment. How much freedom will I have to explore campus? The WAVU daily schedule and level of supervision is comprehensive. We follow Vanderbilt University’s policies regarding the presence of minors on campus, and student safety is prioritized above all else. While we understand that students are responsible individuals, WAVU requires free time and recreational activities to be fully supervised and every student to be accounted for at all times. We want you to have a wonderful time while you’re with us on campus, and we encourage new friendships and community building at every turn. May I bring a cell phone, iPad, or other electronic device? Yes. However, we do have restrictions on use of these devices, which we will ask you to follow. The policy for use of electronics will be detailed by your instructor and/or PTY staff member at the start of the day. No. Students will have access to computer labs, which will be accessible during class time if needed. When students are not in class, they will be at lunch, dinner, or engaged in recreational activities during which computer use is discouraged. WAVU is an academic environment that requires a casual but appropriate dress code. We ask that students use good judgment in packing for the weekend. Clothing with offensive language, symbols or designs is unacceptable. Revealing clothing is also unacceptable. Inside is often cool with ample air conditioning. Be comfortable and bring layers! What is the “application priority window?” How does it affect my student’s application? All applications received during the application priority window (the first 24 hours when we accept completed WAVU applications) will be placed in a priority pool regardless of the particular date/time submitted. This means that any complete and qualifying application submitted during the window has the same chance for placement. At the close of this window, all applications received will be randomly assigned a number determining their placement in the review queue. Applications received after the application window will be time and date stamped upon arrival and reviewed in order of receipt. What does this mean to your student? Because our courses fill so quickly, we highly recommend that you submit your student’s application during our priority window for the best chance at placement in his or her top ranked course. While most classes fill within the application priority window (first 24 hour period), we will continue to accept applications until all courses are full. Why does WAVU require an eligibility determination? WAVU specifically designs courses for academically advanced learners. Our instructors teach their courses at an accelerated pace and at a level of depth which research suggests works particularly well with academically gifted students. We want WAVU to be a good curriculum match for your student, and out-of-level standardized test (ACT/SAT) with scores at the 85th percentile (in either math or reading) are typically a good indicator of program success. How does WAVU determine financial aid eligibility/awards? Eligibility for financial aid and the financial aid award amount are determined based on financial need. Families must submit their most recent federal tax return, the completed financial aid application, and any other documents that might prove helpful in order to demonstrate need. We will contact you shortly thereafter with the award amount. All admissions decisions for WAVU are need-blind. No commitment to the program is required until you receive your financial aid decision and subsequent tuition balance. I am applying for financial aid. Should I send the financial aid application along with my student’s application for admission? When applying for admission to WAVU, be sure to indicate, when prompted, that you will be applying for financial aid. You will complete the admissions application and submit it (online) or mail it (paper application) along with the $35 application fee. Once the admissions application is received, you will receive an email with the financial aid application attached. You can fill out the financial aid application and mail/email/fax it along with any relevant documents to our office. Does WAVU award full scholarships? No. All financial aid awards are partial. Is there a part of this day that is geared toward parents? Yes. Once students depart for their first laboratory session, parents are invited to gather in the Wyatt Rotunda for an informational session on gifted and advanced learners. More information on the spring talk to follow via email. 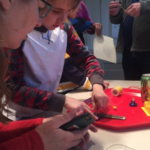 Additionally, parents are welcome to return in the evening to catch a glimpse of their students’ laboratory experience in our WAVU Open House. Will I get to meet my student’s instructor? Yes, if you wish. 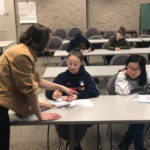 Optional classroom Open Houses will be available to parents and guardians during the final lab session of the WAVU Saturday prior to check-out. Are all meals for students the weekend included? We provide lunch and dinner for the students, and light refreshments for parents in the morning. Can WAVU accommodate dietary restrictions? Yes, with adequate prior notice. Where is check-in, and what time does it begin? Check-in begins at 8:30 am CT on the day of the program on the Atrium side of the Wyatt Center on Vanderbilt’s Peabody Campus. There will be signs directing you from 18th street. If you wish to use a GPS, please use the street address 1930 South Dr. Additionally, driving directions and general WAVU information will be communicated to you via email prior to the program. What academic materials does my student need for class? All students are expected to bring a notebook and a writing instrument. If your son or daughter is in a math or science course, a calculator is recommended. For students in a science-based course, pants and closed-toed shoes are required for labs and fieldwork. When do I check out my student? Parents are encouraged to attend the laboratory Open House that takes place at the end of the evening session. WAVU officially ends on Saturday at 8:00 PM, so we ask that whether or not you attend the open house, you are prompt in collecting your student. Many thanks in advance for your punctuality. Important note: each parent or guardian will be asked to present identification before leaving with the student. Please be sure to have a picture i.d. with you when you come. A student who has not been placed in a course and remains on a waitlist may withdraw from the waitlist at anytime and receive a refund for the tuition (less the application fee). A student who withdraws from the program after being placed in a course will receive a tuition refund (less the application fee) if WAVU is notified before the stated deadline. Please visit our general timeline to view specific dates for each session.